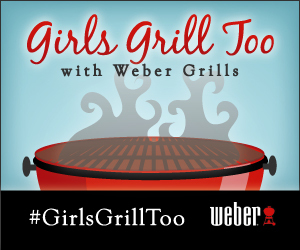 Monday, I talked about how Weber grills are known for their quality and durability, which means it is a great value for your home, hence a worthy investment. In my opinion, there is no reason to settle for less and have to buy a new grill every couple of years unless you just like burning your money! So, how do you keep from having to purchase a new grill every couple of years? THE ANSWER….. You maintain it properly! As you know, sometimes getting a bargain isn’t necessarily about buying the cheapest product out there. For me it is also about quality. Weber is what I consider a gold standard for grills. However, having a quality grill is not going to help you if you don’t take care of it properly. I love how Erin said it..
Plus they even have online cooking classes! Weber provides these tips on maintaining your grill and extending it’s life, which will save you money! As a rule of thumb, grills should be cleaned before each use. Burn off any residue by turning the grill on high, then brush the cooking grates with a stiff wire grill brush. Follow these five steps from national grilling expert Jamie Purviance (author of the New York Times Best-Seller Weber’s Way to Grill™ and the newly released Weber’s On the Grill™ cookbooks) to get that outdoor gas grill really clean. 1. Clear the burner tubes of any blockages, which restrict gas flow and may prevent the igniter from lighting. To clean tubes, brush the portholes with a stainless steel wire brush in an up and down motion. Do not brush lengthwise across the ports, as this will only push debris from one hole to another. 2. Clean the Flavorizer Bars—Many grills contain heat distribution systems such as Flavorizer Bars to help prevent flair-ups. To clean them, simply turn your grill on high and allow the residue to burn off. Occasionally brush the bars with a grill brush or scrape with a putty knife. Then wipe with a rag and warm soapy water. 3. Clean the warming racks–A soapy, fine steel wool pad will keep the warming racks and grill baskets clean and free of smoke stains and debris. Rub the racks gently and then rinse thoroughly. 4. Carefully scrape the inside of the grill with a putty knife, and push the residue through the bottom hole. Remove the cool bottom tray from under the grill and place over a trash can. To deep clean the tray, use warm, soapy water and a fine steel wool pad. Check the catch pan liner monthly and replace when needed. (Weber catch pan liners can be purchased at most hardware stores). 5. Clean grease drippings on exterior surfaces by using mild, soapy water. Never use an abrasive, lemon-based or oven cleaner, as it can scratch the stainless steel or remove the paint finish. If you have a stainless steel finish, use an environmentally-friendly stainless steel cleaner and a soft cloth to give it a nice shine and remove fingerprints. For porcelain enamel, use a cloth and warm soapy water. What are your tips for maintaining your grill and saving money while grilling out? Best thing we did was replace those wooden side and front shelves with some scrap ‘Corian’ we had available. Whoever thought those wooden slats were a good idea was just wrong. Our inexpensive $100 grill of 12 years ago is still going strong.